The SD FFA Email Newsletter highlights special projects of the SD FFA and SD FFA Foundation. Please forward this newsletter to others you know who are involved and interested in FFA and agriculture education. Thank you for your support of the FFA in South Dakota! Each summer I'm amazed by our agriculture teachers and the work they do during their "summer breaks." I hear from them regularly over the summer, as they tackle a variety of projects and events. I'm so proud of all the work each of them do when many people think they take a break from their duties. Many of these agriculture teachers are participating in professional development opportunities, including the Region III NAAE Conference this month. They're also continuing their Supervised Agricultural Experience visits and working with national qualifying individuals and teams to get ready for National Convention in October, among other community specific projects. An agriculture teacher never rests and I respect the work that they do and the impact they have on students. I continue to hear many stories from past FFA members about the impact that their agriculture teacher has had on them and that is why I'm confident that your money used to support them is well invested. Gerri Ann Eide, Executive Director, SD FFA Foundation, Inc. Thanks for helping "transform" our purpose into action! Don’t wait until you can give more, act now to make a difference. 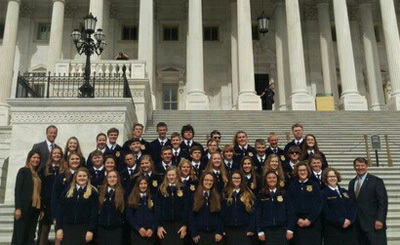 June 5-12th, 40 SD FFA members attended Washington Leadership Conference (WLC), a National FFA program focused on service, bringing important knowledge and skills home to their local chapters. In addition to taking part in community service activities and seeing national monuments while at the conference, FFA members also left WLC with a better understanding of their own personal leadership styles and a community service action plan to implement in their own home communities. A big thank you to Harrisburg FFA advisors Tara Fastert and Todd Marks for organizing the state group, and to the CHS Foundation for assisting with the travel cost. The South Dakota FFA Foundation awarded four $500 travel scholarships to South Dakota FFA members attending. This year’s recipients of the WLC Scholarships are: Danika Gordon, Sturgis Kaylen Stearns, Hot Springs Alicia VanderWal, Sioux Valley and Dalton Howe, Redfield. FFA advisors have been saying this phrase for over 85 years. Opening ceremonies states “The owl is a time-honored emblem of knowledge and wisdom.” Current and former members agree - their advisor, or one from another chapter had a huge impact on their personal growth, career choices and leadership skills. 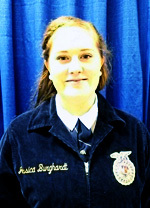 Perhaps you or a family member has a particular memory of an FFA advisor and how he/she touched your life. Join the SD FFA Foundation in saying thank youto FFA advisors for their efforts. Our ag teachers are amazing. Several SD ag teachers will be attending the NAAE Region III Conference June 19-21 in Wahpeton, ND. They will be learning as they participate in workshops, tours, and trainings. Thanks to our Star Partners for supporting our teachers attending this valuable conference ... Northland Ford Dealers, Monsanto, North Central Farmers Elevator; CHS Foundation; ADM; SD Wheat Growers, BASF; Butler Machinery; DuPont Pioneer; East River Electric; Farm Credit Services of Americas; Hanson Associates LLC; Midwest Ag Supply; SD Corn Utilization Council; RDO Equipment; Wilbur Ellis; Producers Hybrids, SD Farm Bureau, US Army ROTC; Cropland by Winfield United, Zoetis; and C & B Operations, LLC. State Officer Speech training (S.O.S); Building Leaders and Strong Teams of Officers (Blast-Off); Career & Technical Students Organization training (CTSO); National Leadership Conference for State Officers (NLCSO); and State President's Conference (SPC) are all trainings the state officers experience over the summer months to prepare them for the challenging jobs they do throughout the year. Thanks to our sponsors who allow officers to attend these events: CHS Foundation, Coop Managers Association, the SD Association of Cooperatives, Jon & Emily Minor, and Brad Bies. Agriculture education teachers/FFA advisors make a world of difference for the students they teach. 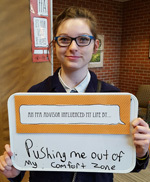 This spring students put into words, as part of an FFA Advisor Tribute Scholarship application, how their ag teachers/FFA advisors have impacted their lives. 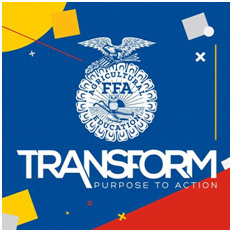 Thirteen outstanding examples of amazing teachers impacting their students have been chosen and submitting students will each receive scholarships to attend a SD FFA Leadership Retreat this summer. Molly Dye, Deuel; Madilyn Wright, Groton; Kaitlyn Graff, Madison; Marie Robbins, Brookings; Seth Petersen, Garreston; Emily Malsom, Garrseton; Nikki Peters Madison; Elizabeth DeBoer, Deuel; Jessica Colville, Lemmon; Randi Tivis, Sturgis; Shelby Ruland, Wall; Kade Wagner, Rapid City and Ash Grenstiner, Wall earned scholarships. The students wrote essays about how their FFA advisors have made an impact on their lives. Each of these students thinks their advisor is one of the best there is - click here to see what they say! 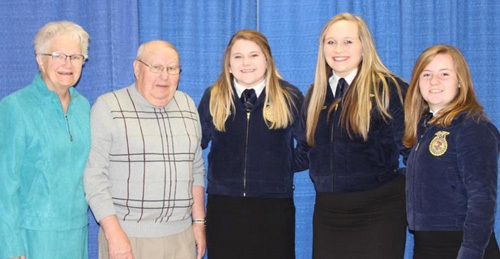 Scholarships are made possible through the SD FFA Foundation by West River Electric Association, Sioux Valley Energy, and the Walt Johnson Memorial Fund; in memory of two past FFA advisors: Leonard DeBoer and Walt Johnson. This year the SD FFA is hosting two Leadership Retreats – one at camp Bob Marshall, Custer, and one at Swan Lake, Viborg. Retreats focus on defining leadership, identifying personal strengths, setting goals, respecting diversity, exploring opportunities available through FFA, and service learning. Contact gerri@sdffafoundation.org if you’re interested in sponsoring one of these scholarships. Come join the fun of summer with St. Paul Saints baseball and support FFA at the same time. Join us July 23rd for FFA Day with the Saints. FFA families, friends, and partners have the opportunity to be involved in fun on-field experiences! FFA guests are invited to a pre-game picnic starting at 3:30pm. Other activities for all ages! Game time is 5:05pm. Buy & Print your FFA Day tickets online - visit: saintsgroups.com Password: FFA2017 (click here) to get tickets now! Winner FFA wins National Chapter Award! The National Chapter Award Program, the highest honor a chapter can receive, recognizes FFA chapters that actively implement the mission and strategies of the FFA. For the overall state award, a chapter must complete at least 15 activities: one for each of the five quality standards in each of the three divisions - Growing Leaders, Building Communities, and Strengthening Agriculture, and meet the minimum requirements outlined in the National Quality FFA Chapter Standards. 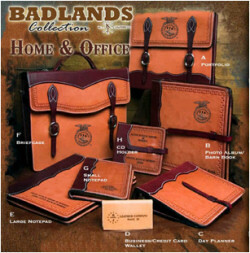 The SD FFA Foundation has partnered with K Bar J Leather of Newell, SD to offer a selection of beautiful high quality leather items. They were marketed at National FFA Convention and awarded to State CDE winners with the FFA logo. They can be ordered with custom logos for promotional use by businesses … talk to your boss about utilizing them as around the office! SD FFA gets a cut of all orders that mention us. Click here to see more of their products! © 2017 South Dakota FFA Foundation, Inc.